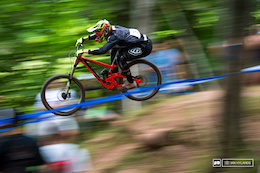 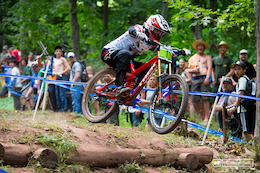 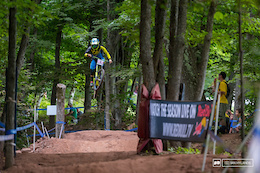 Cam Zink gave Missy Giove a nice new YT to race on at Windham. 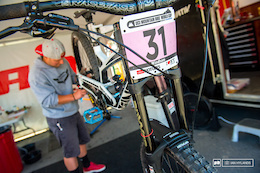 SRAM's Evan Warner gets it all ready for the day. 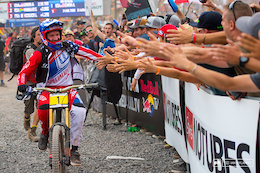 Loic Bruni was having a great run when he flatted his rear tire, and while he didn't finish in the top 50 he still put in a good effort for the crowd. 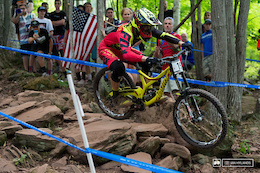 Steve Smith put in a solid race today, good enough for 5th place. 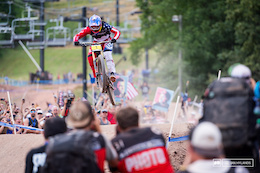 Marcelo Gutierrez has been having a great year as evidenced by the number 7 plate on his bike. 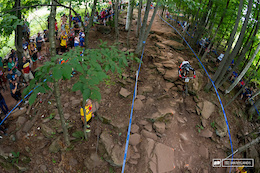 That will likely change a little after his 19th place finish today. 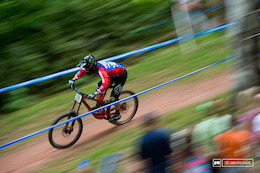 Luca Shaw, not his best world cup result, but still a good one for the young American, 16th place at the end of the day. 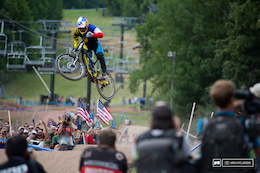 Air Horns, they really blow. 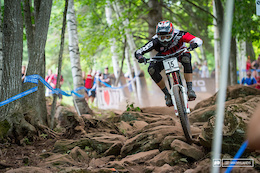 Wyn Masters is consistent, 29th in qualifying, 29th in the final. 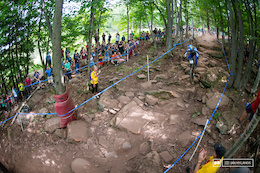 Pierre Charles Georges pinned through the hecklers at the road gap, 47th place. 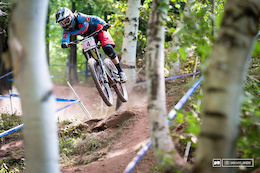 Rachel Atherton clinched the overall World Cup title in qualifying yesterday, and then went on to win by 9 seconds today in the final. 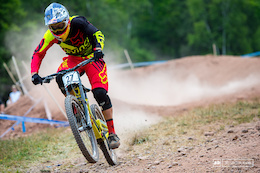 Tahnee Seagrave made it into 3rd place today, completing the British sweep of the top 3. 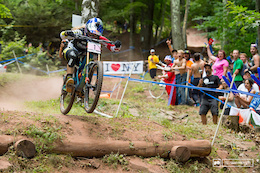 Casey Brown, while she may not have made it onto the podium she definitely showed a lot of style over the bigger stuff on the course. 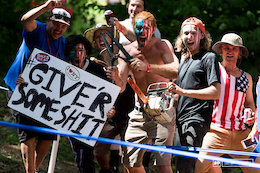 The hecklers were out in force today. 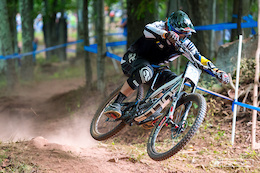 Laurie Greenland extended his series lead in the juniors with his win today. 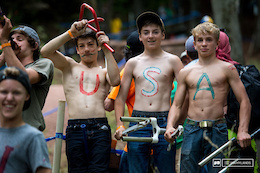 We start them early here in 'Merica, these guys were heckling and making noise with the best of them.